In this update from the president, Victor Kubik shares some info from the recent annual Feast coordinators conference, the recent Beyond Today tapings and the recent Inside United podcast. He also talks about the spiritual journey of Paul from wretched to righteousness. During the annual Feast coordinators conference. 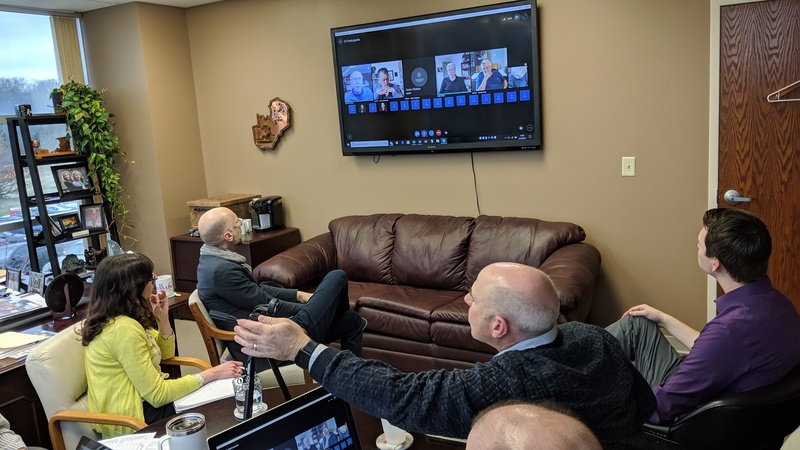 “The annual Feast Coordinators conference convened on Feb. 4 and 5 via an Internet connection. There were 32 people involved, including Feast coordinators from the U.S., Canada and the Caribbean, home office staff and volunteer support. “President Victor Kubik opened the conference with the main reasons for observing the Feast. He quoted from Deuteronomy 14: ‘that you may learn to fear the LORD your God always’ and stated that this is the ‘why’ of the Feast of Tabernacles. The planning and preparing of all the subsequent details stem from this vision. “The Operation Manager of Ministerial and Member Services, Mark Welch, greeted everyone and expressed how he is looking forward to the Feast of Tabernacles aspect of his new responsibilities. He noted that at the Feast we are there to worship the coming King. “Some new ideas were discussed, but mostly it was determined to follow the principle of ‘if it isn’t broken, then don’t fix it.’ Nevertheless, some behind-the-scenes improvements will be implemented. “We discussed special music, budgets, youth education, membership surveys at each site, assigned articles for publications related to the Feast and better use of the websites for each Feast site. Three more Beyond Today television episodes were recorded yesterday in our new video recording studio. The studio audience consisted of church members, ABC students and Beyond Today co-workers who were all very engaged during this two-hour recording session. The new programs recorded were You Can Understand Bible Prophecy by Steve Myers, The Book of Revelation Unveiled by Darris McNeely, and Why Were You Born? by Gary Petty. My guest this week is our new Operation Manager, Mark Welch, who has been on the job in our office here for a month now. He discusses some of his thoughts about his new role and priorities in Ministerial and Member Services. If you as a follower and disciple of Jesus Christ were to take a spiritual inventory, where would you come out? When one considers the apostle Paul, the word “extraordinary” comes to mind. He came to God’s service in a most unusual way. Before the astonishing miracle of his conversion, Paul was already well educated and well known, even as a young man. He describes himself as a “Hebrew of the Hebrews… concerning the righteousness which is in the law, blameless” (Philippians 3:5-6 Philippians 3:5-6 5 Circumcised the eighth day, of the stock of Israel, of the tribe of Benjamin, an Hebrew of the Hebrews; as touching the law, a Pharisee; 6 Concerning zeal, persecuting the church; touching the righteousness which is in the law, blameless. American King James Version×). He held the coveted title of citizen in the Roman world, a prized status. He sat at the feet of leading early rabbinic scholars in Jerusalem. He was highly educated to the point that he could easily cite Greek poets during his speech in Athens (Acts 17:28 Acts 17:28For in him we live, and move, and have our being; as certain also of your own poets have said, For we are also his offspring. Paul wrote much of the New Testament. Through the mighty grace of God, Paul performed public miracles, healings and much more (Acts 19:11-12 Acts 19:11-12 11 And God worked special miracles by the hands of Paul: 12 So that from his body were brought to the sick handkerchiefs or aprons, and the diseases departed from them, and the evil spirits went out of them. American King James Version×). In the service of God, he was physically beaten with rods three times, once nearly stoned to death, flogged five times, shipwrecked three times (once floating around in the Mediterranean Sea for more than 24 hours before being rescued) and basically in constant “peril” as he crisscrossed the Roman Empire preaching the gospel of the Kingdom of God (2 Corinthians 11:23-27 2 Corinthians 11:23-27 23 Are they ministers of Christ? (I speak as a fool) I am more; in labors more abundant, in stripes above measure, in prisons more frequent, in deaths oft. 24 Of the Jews five times received I forty stripes save one. 25 Thrice was I beaten with rods, once was I stoned, thrice I suffered shipwreck, a night and a day I have been in the deep; 26 In journeys often, in perils of waters, in perils of robbers, in perils by my own countrymen, in perils by the heathen, in perils in the city, in perils in the wilderness, in perils in the sea, in perils among false brothers; 27 In weariness and painfulness, in watchings often, in hunger and thirst, in fastings often, in cold and nakedness. If ever there was a true disciple of Christ, or a true apostle (one sent forth), it was Paul of Tarsus. He firmly established a very high standard for us to emulate today (1 Corinthians 11:1 1 Corinthians 11:1Be you followers of me, even as I also am of Christ. But given all of those extraordinary bona fides, Paul wrote a most remarkable statement to the Romans: “I know that nothing good dwells in me, that is, in my flesh. For I have the desire to do what is right, but not the ability to carry it out” (Romans 7:18 Romans 7:18For I know that in me (that is, in my flesh,) dwells no good thing: for to will is present with me; but how to perform that which is good I find not. How did this man of seeming extraordinary capacity describe himself? “Wretched man that I am! Who will deliver me from this body of death?” (Romans 7:24 Romans 7:24O wretched man that I am! who shall deliver me from the body of this death? American King James Version×, ESV). That word “wretched” (Greek talaiporos ) means to be deeply miserable, distressed, beaten down from strain, full of trouble. Ironically, Christ’s apostle to the Gentiles described himself as full of misery because he couldn’t measure up to God’s standards! While powerfully noting that the solution to this misery lay with God through Jesus Christ, Paul left us with a remarkable and sobering conclusion: “I myself serve the law of God with my mind, but with my flesh I serve the law of sin” (Romans 7:25 Romans 7:25I thank God through Jesus Christ our Lord. So then with the mind I myself serve the law of God; but with the flesh the law of sin. What?! How could this be? One of the most powerful New Testament men of God a slave to sin? American King James Version×such as love, joy, peace, patience, kindness, goodness, faithfulness, gentleness and self-control. American King James Version×), what does that mean for you and me? Do we have hidden sins, spiritual challenges that we quietly grapple with, even though we may present an image of rock-solid spiritual success to those who cross our path? As a long-time couple in the ministry of Jesus Christ, my wife Bev and I have experienced this ourselves. We are but human. We strive to follow the law of God as it lights a spiritual lamp to guide our spiritual journey through life (Psalms 119:105 Psalms 119:105Your word is a lamp to my feet, and a light to my path. American King James Version×). But we fall short of the mark. In our ministry, others—people who publicly seem to have it totally together, the seeming near-perfect example of a disciple of Christ—have related to us their struggles and the wayward thoughts of their minds. Not one of us is perfect. The Bible reveals to us that when we come to the knowledge of the truth, we don’t bring a lot to the table. Because of growing up and living in a world that “lies in the power of the evil one” (1 John 5:19 1 John 5:19And we know that we are of God, and the whole world lies in wickedness. American King James Version×, ESV), how we think comes from a place that the ancient prophet Jeremiah described as “deceitful above all things” (Jeremiah 17:9 Jeremiah 17:9The heart is deceitful above all things, and desperately wicked: who can know it? Consider that Job was such a person who appeared to have his life altogether. He was wealthy, had a large family, and was careful about how he worshipped God. In chapter 42 of Job, we find that he discovered that he had overstepped his bounds and missed a critical spiritual mark. He, like Paul, found himself in a state of misery and wretchedness to the point where he admitted, “therefore I despise myself, and repent in dust and ashes” (Job 42:6 Job 42:6Why I abhor myself, and repent in dust and ashes. American King James Version×), even after we become baptized members of the very Body of Christ! American King James Version×, New King James Version). Grace in the Bible often represents the expression of God’s power delivered through the Holy Spirit. The word grace appears more than 100 times in the New Testament and describes God’s direct intervention with us in reconciliation and in the bestowing of marvelous favor! The application of God’s grace spiritually bridges the gap between our efforts, our willingness to surrender, and the connection to God Himself through Jesus Christ. The truth? God’s grace transforms our wretchedness into His righteousness! Grace—the manifestation of God’s power into our lives—brings us to obedience. It gives us the capacity to receive, experience and pass on the love of God Himself! Paul wasn’t good enough. And he knew it. Likewise, Job. Therefore, we can understand that all of us need God’s grace. None of us are righteous or holy of our own accord. That’s why we are directly instructed, “Let us then with confidence draw near to the throne of grace, that we may receive mercy and find grace to help in time of need” (Hebrews 4:16 Hebrews 4:16Let us therefore come boldly to the throne of grace, that we may obtain mercy, and find grace to help in time of need. American King James Version×, ESV). This is grace in action! Have you fallen short? Are you overwhelmed, feeling full of misery? The throne of grace awaits you! We all need grace. We all need God’s favor. Seek it earnestly today!